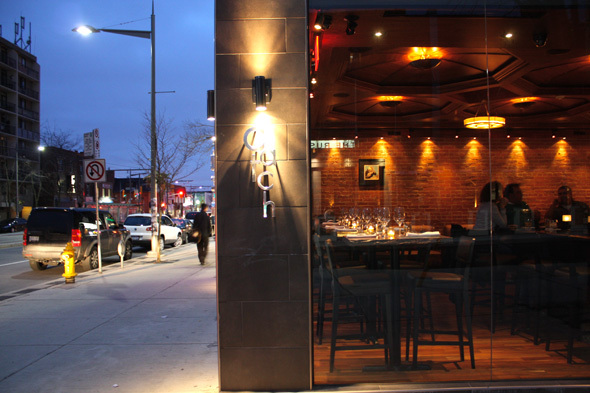 Catch, which opened quietly early in February, boasts itself as the new it-spot for fresh fish in Toronto. From the owner of The Rushton , Francesco Pronesti's latest project incorporates sustainable fishing but lacks a flashy lure. I arrive at 744 St. Clair Ave West to find the front door locked. Inside, the bartender waves us around the corner to a nondescript door on Rushton Road. Throughout the night others attempt and fail to enter as I did, which is a bit awkward and disruptive. The crowd is 40-plus and the music is a confused mix from my iTunes account seven years ago. I'm off to a rough start but soon our sweet (struggling actor) server arrives. His charm and knowledgeable banter promises smoother sailing ahead. Arriving in an enticing display the mussels come with a classic garlicky aroma, and my mouth starts to water. I dig in and I'm not disappointed. There's no gritty feel; the shellfish are steamed to salty perfection. The secret is a lobster broth, which lends the mussels an almost sweet and tangy flavor. Chef Nigel Finley, a Halifax native, proves he's no novice when it comes to bivalves. The Brussels sprouts arrive fluffy and picture perfect green. After a quick sauté in white wine the vegetable holds its firmness without being undercooked. 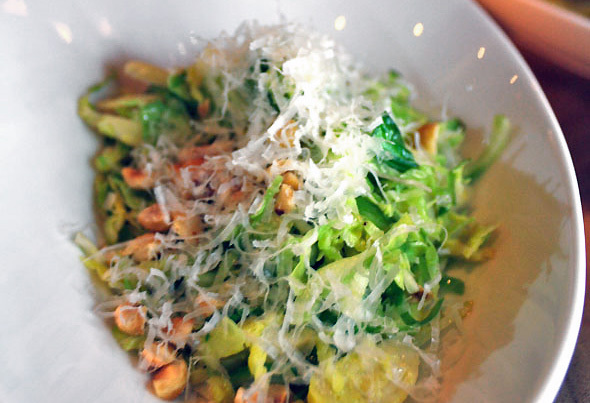 Paired with hazelnuts and Parmesan, I want the bowl to possess the power of Mary Poppins' magic purse and never end. After my arctic char let down at The Westerly I'm hesitant to give the fish a second chance, but I decide to be the bigger person and dive in headfirst. I'm amazed at how juicy and brittle the fish is. 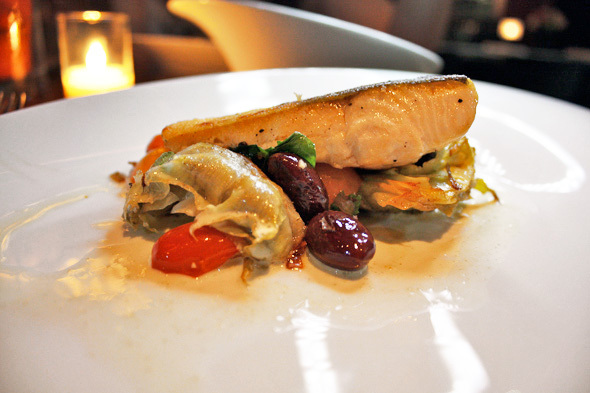 The dish also houses roasted artichokes, kalamata olives, cherry tomatoes and tarragon buerre blance. The dish is light but packed with sultry savor. The hot fishy affair I'm having is duped by the sea bream that tastes like bad wedding fare. 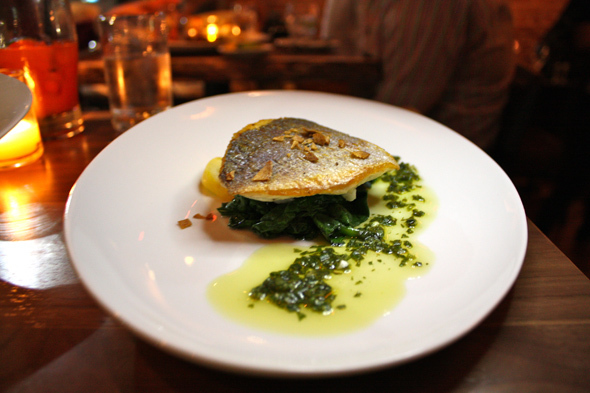 Bream is a flat yet succulent fish, but the kitchen has dropped the ball on this one. Coming stuffed with blue crab and no real taste, I'm underwhelmed. The attempt to infuse flavor with a crab stuffing falls flat. At this point in the night I feel a bit let down, so I desperately await the dessert menu. However our server offers us a treat that isn't on the menu tonight — the peanut butter and jelly sandwich. I have no idea what to expect after the bream, but I'm praying for a buoy to get me back to dry land. Bread, check. Peanut butter, check. Strawberry jelly, check. Vanilla ice cream, check. 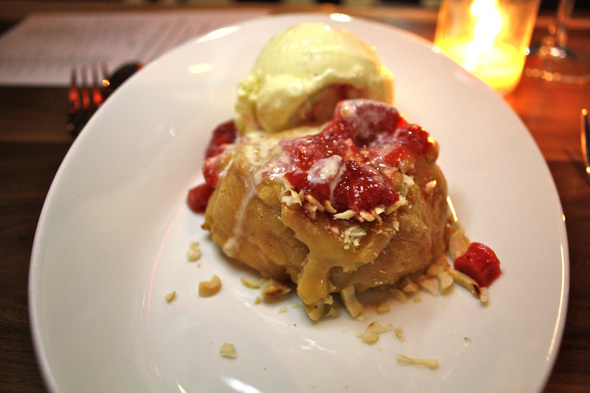 It's a delightful gooey mess that has upstages the rest of the meal. That may not be the best sign for a fish-centric place, but it sure helped temper my mixed feelings about the meal.